“What is the best month of the year to witness the Great Wildebeest Migration?”, is one of the first questions that comes to mind when planning a safari getaway, however, what you should be asking yourself is, “Where will the Great Wildebeest Migration be at ‘x’ time of year?”. Annual rainfall guides over two million wildebeest, zebras, and gazelles as they move in clockwise rotation through Tanzania’s Serengeti, and Kenya’s Masai Mara, in their never-ending search for food and water. During the migration, animals risk their lives, from thirst, hunger, exhaustion, and drowning while dodging their carnivore predators. Moreover, during the migration, new life is created, completing the full circle of life. 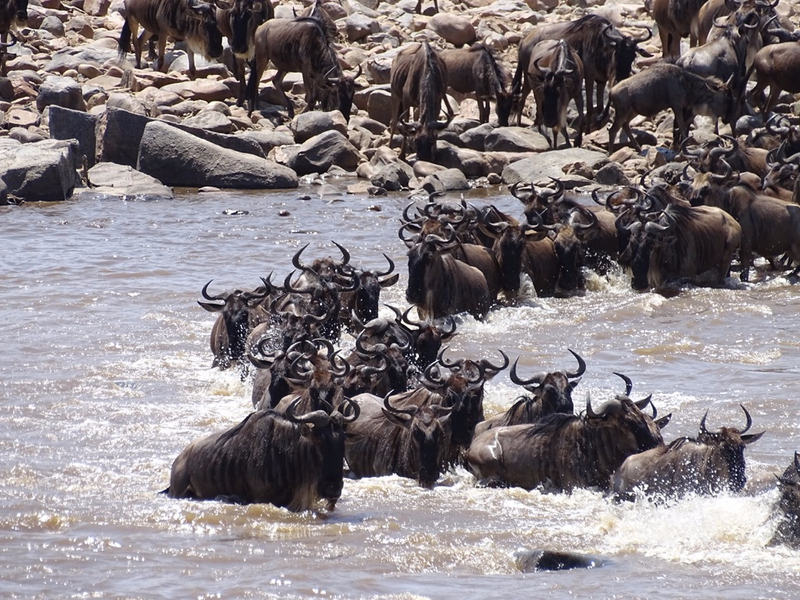 The Great Wildebeest Migration is never ending, which means you can witness the extraordinary events year round. Here is an overview of the migration location throughout the year. The Southern Serengeti’s vas grass plains extend into the Ngorongoro Conservation Area. January is the first rains in the southern Serengeti.The herds congregate around Lake Ndutu in the Ngorongoro Conservation Area. February is the month with the highest birthing rate, sometimes seeing as many as 8,000 born each day. The Wildebeest Migration moves north into the plains of the southern Serengeti, expanding out to the Western Corridor and center of the park at Seronera. The Wildebeest herds stretch out from the Western corridor throughout the park. One group heads towards the Grumeti River , then making their way to Kogetende area in July. The other herds move north of the Serengeti, passing straight up the middle through Seronera, Lobo and up to the Bologonja River near the Eastern border. The Great Wildebeest Migration is in the Northern Serengeti at Kogatende and in Kenya’s Masai Mara. The famous, ‘river crossings’ often occurs here daily. The herds move south towards the fertile lands of Ndutu plains where the rains will have rejuvenated the grasses, producing fresh grass to start the cyclical process all over again. Remember, wildebeest, similar to rainfall, are not completely reliable or predictable. This outline is an indicator of where the herds are typically throughout the year. It can be a bit overwhelming, understanding the intricate patterns of the migration, but do not worry, Proud African Safaris will take care of all the planning and navigating, steering you in the right direction for your unforgettable safari experience. The Great Wildebeest Migration is truly the greatest show on earth, and Proud African Safaris will ensure you have front row seats the view the action.